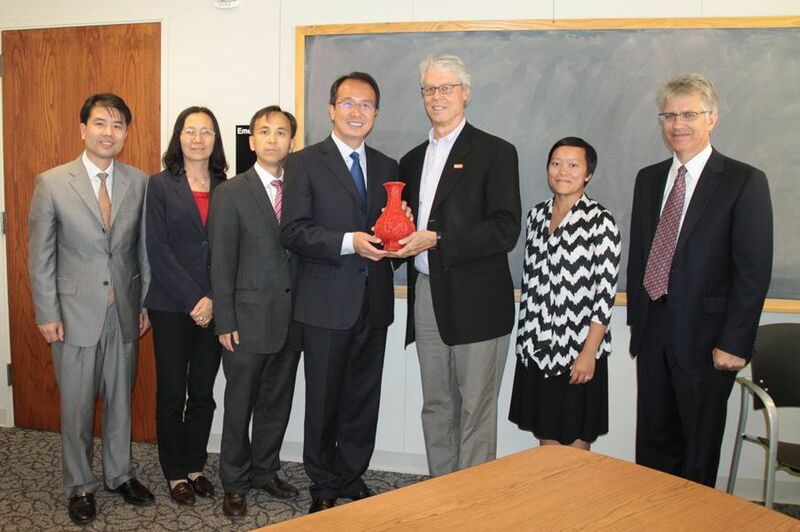 On September 21, Consul General Hong Lei visited the City of Des Moines, the State Capital of Iowa, and met with Mayor Frank Cownie. Consul General Hong Lei said that since the establishment of sister-city relationship between Des Moines and Shijiazhuang, Hebei Province in 1985, the two sides have maintained active exchanges in various fields. On the occasion of the 30th anniversary of the sister-city relationship last year, the two sides renewed the sister-city agreement and reached consensus on further cooperation in the fields such as economy, trade and culture. At present, China-US relations continue to grow with a dynamic momentum and friendly cooperation between China and Iowa keeps deepening. The Consulate General would like to join hands with the city government to deepen friendship and expand cooperation between the two sides, adding more positive energy to the development of China-US sub-national cooperation. Mayor Cownie warmly welcomed Consul General Hong Lei and spoke highly of the great achievements of China's economic and social development. He said that many Des Moines companies see China as an important market. The city government welcomes more Chinese enterprises to come and invest and looks forward to strengthening exchanges and cooperation in environmental protection, culture, education and other areas with China.